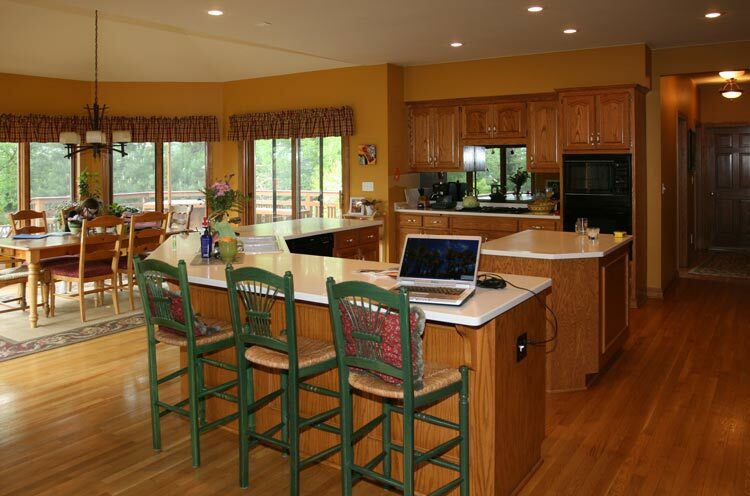 Not Every Kitchen Is A Complete Redesign. 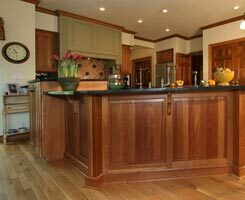 While happy with the layout of the original cabinets, the client’s were not happy with the look of the Oak Cabinets that matched the oak flooring-the continuation of wood overwhelmed the space. 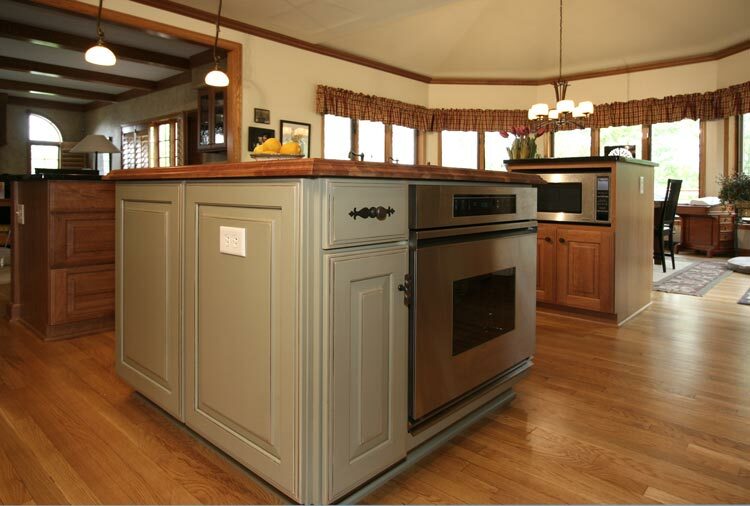 They desired a new kitchen with an English country theme and with contrasting colors. 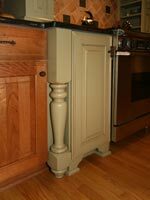 The photos express the overall theme and the use of distressed finishes, turned posts, corbels, arched toe kicks, and wide moldings enhances the desired theme. 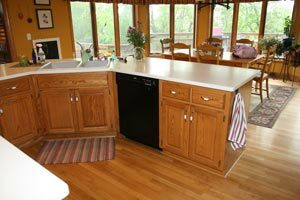 Spacing requirements were addressed around the islands to maximize cabinet and countertop space, but to also maintain accurate spacing for traffic flow. The new floor plan incorporates multiple centers. A new slide-in range and new separate oven each have their own work space as well as the sink and dishwasher clean-up space. the dual islands allow traffic to flow continuously and does not cut off in any one direction. Granite countertops, a butcher block island countertop, and an impeccable factory finish on the cabinetry provide our clients with functional materials that will last for many years to come. Existing large windows in the dinette are add great natural light during the day. As a relatively new home, the existing recessed can fixtures light the kitchen space effectively. We added two pendants to accent the snack bar and under cabinet task lighting at the desk. In need of a focal point, the wood hood was created in Cyprus green to anchor the space. 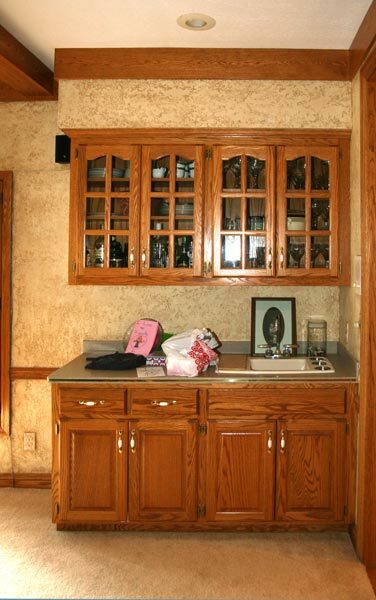 Cherry cabinets flanked on either side add symmetry. this contrast of green paint and stained cherry is repeated throughout the space. 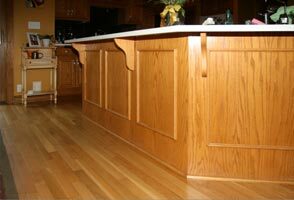 Horizontal line is emphasized on the length on countertops and is continued on each work space. 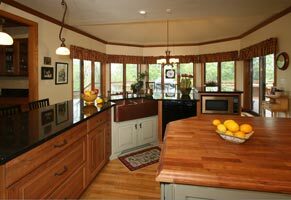 Variations in height of countertops and cabinets break up some of this continuity to bring interest into the space. Rustic items, like a copper farm sink, oil-rubbed bronze faucets, and hand-made backsplash tiles add texture and contrast to the kitchen. 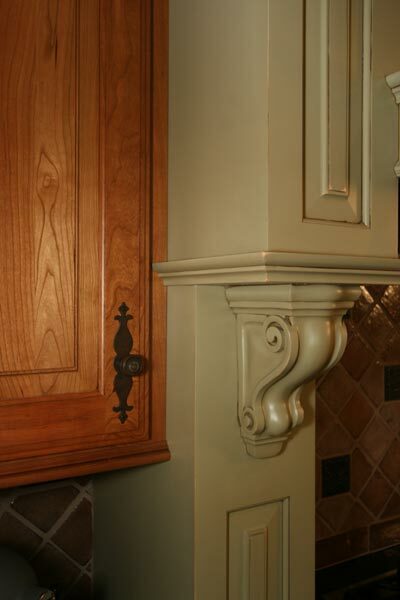 Attention to detail is shown in many areas of the remodeled kitchen. 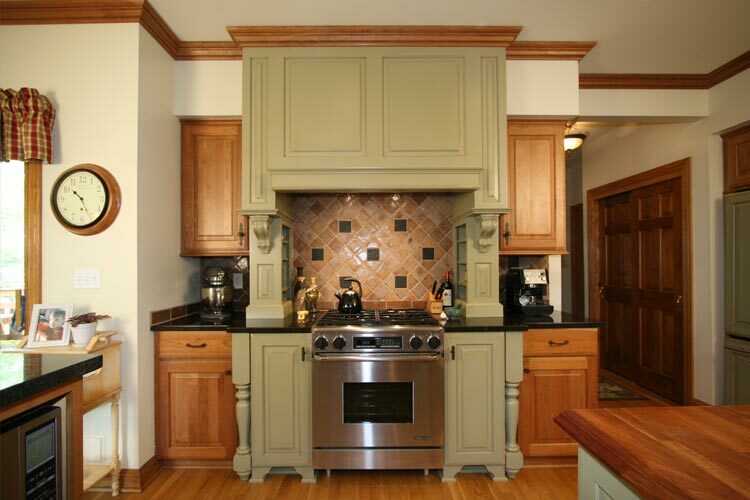 The backsplash tile is laid out to create symmetry and balance: The accents of corbels, corner posts, furniture base, and wainscot panels are carefully sized and placed; the detailed edge profile on the cherry butcher block it repeated in similar lines on the crown molding and door edge profiles. 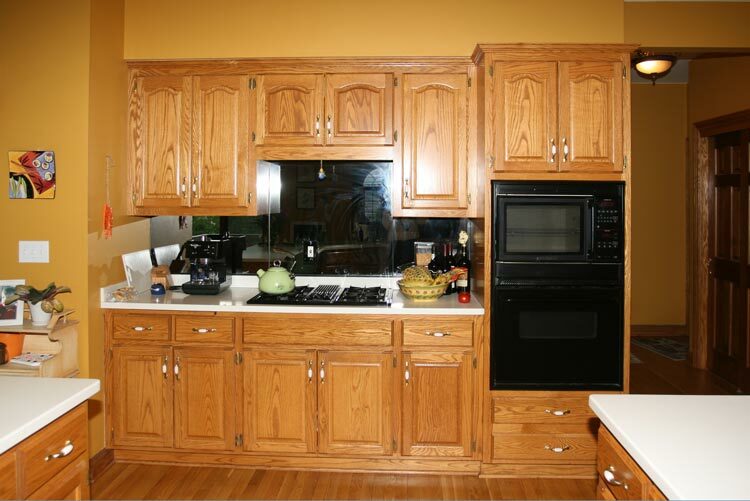 Most innovative ideas were used in the cabinetry. 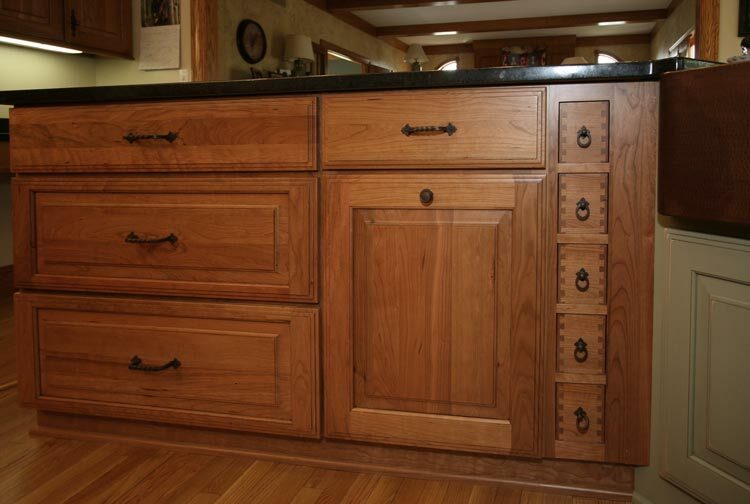 Some cabinets were custom build and designed to be seamed together to have a one-piece look. 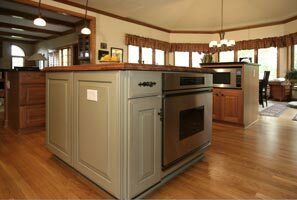 This concept was used on the center island cabinets, the microwave cabinet, and the hood surround. Concealment of the refrigerator was another innovative idea; a new cabinet depth refrigerator was installed with custom built panels that match the other cabinets. This not only hides the refrigerator, but also allows better spacing in front of it due to its shallow depth. Challenges were addressed in the design phase. The client wanted more furniture-like cabinetry. 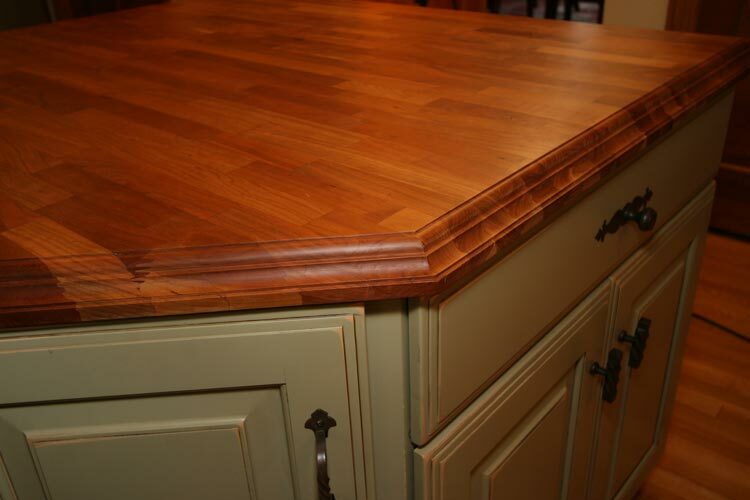 We achieved this by creating custom pieces like the hood and island. These large items needed to be sized appropriately to fit through existing doors. This allowed us to avoid problems before the installation even began. The client’s budget was established at the “first” consultation between designer and client. At that point the budget set the tone for the space. Simple posts and corbels at the snack bar and adding distressing to only the painted cabinetry, did not “break the bank”. 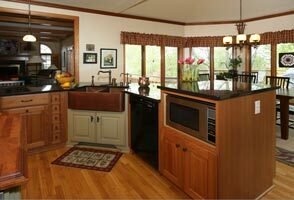 Instead, these small details enhanced the overall design and allowed the client to get a copper farm sink and second oven; they also were able to replace the wet bar cabinets and countertop as well. The existing kitchen lacked contrast and interest. 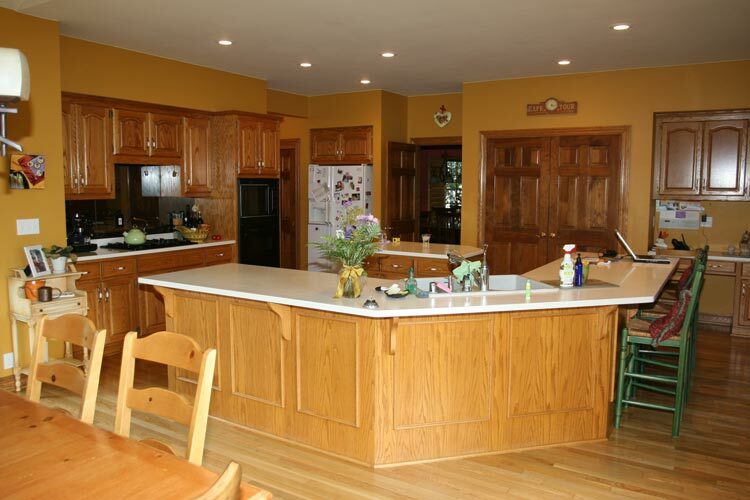 The wood floors, wood cabinets, and golden walls blended together to create a very bland kitchen. 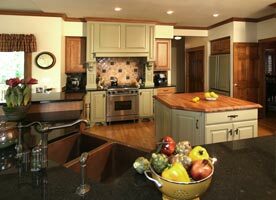 Now, the new kitchen boasts richness in textures, materials, and details. 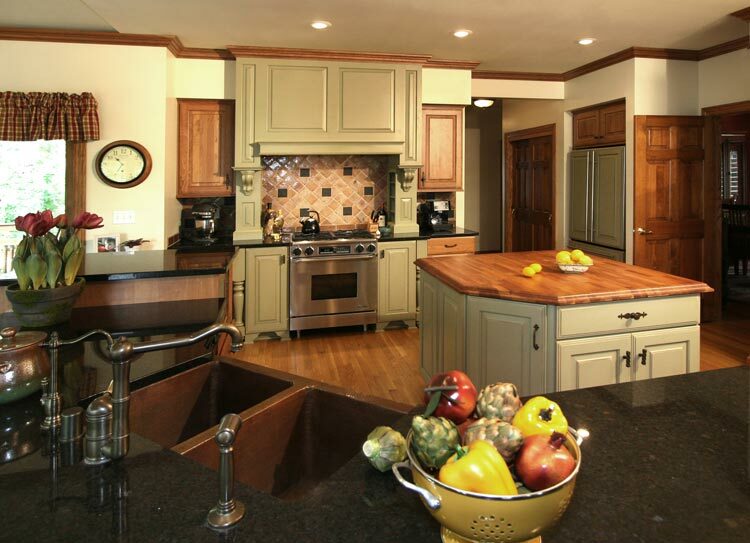 The variety of colors with cherry and cyprus green cabinets creates a complementary harmony. 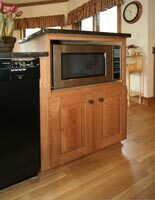 This wall lacked balance with a heavily planted oven cabinet and offset cooktop. The mirrored backsplash gives an outdated appearance to the space. 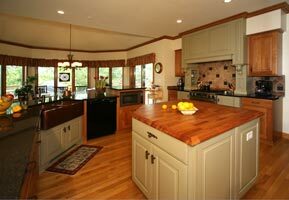 Being the focal wall of the kitchen, a change was necessary to achieve better balance and attention. Now, your eye is immediately drawn to this wall. The custom centered hood surround and cabinets below have furniture style details. 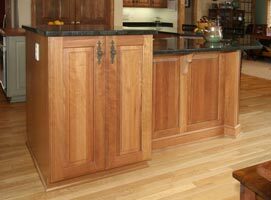 The cherry cabinets on either side provide symmetry on the focal point wall and hidden shelf storage makes use of otherwise wasted space. 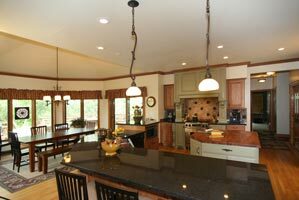 The Copper Black granite countertops and hand-made tile backsplash complete the look. 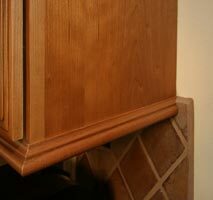 Detail of open shelves on the sides of the slide in stove. 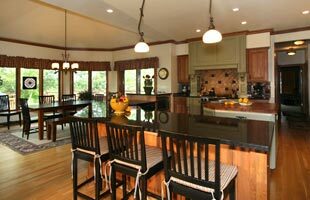 The existing center island works well for extra countertop space. However, it was built with a void that could be redesigned to be used as storage. 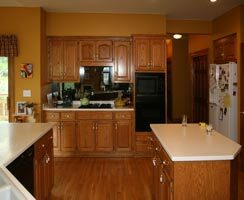 By squaring off the back corner, a full size cabinet is added as well as an angled cabinet across from the sink. In addition, the island was made a little larger, to encase a second oven. 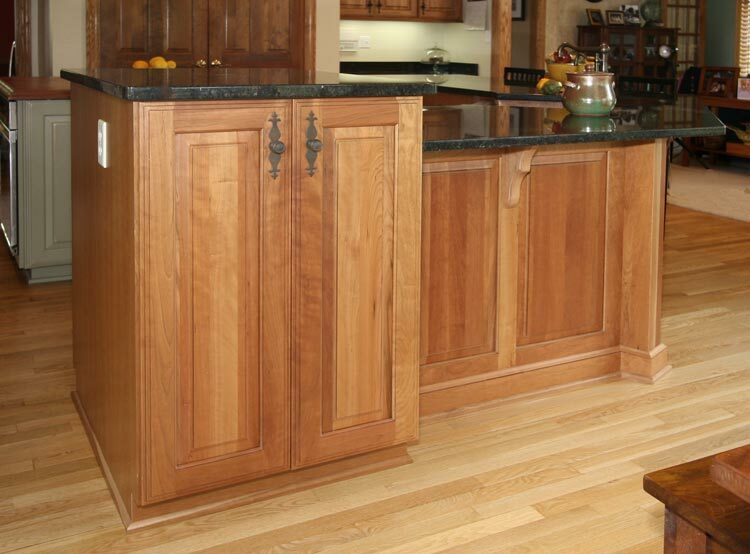 False side doors and cherry butcher block finish off the look. Back side of the island. The view from the dinette table is dominated with a long line of countertop and uninteresting carpentry. Your eye is drawn to the perimeter island and a very bold white countertop. Now, a raised cabinet breaks up the long, horizontal emphasis to provide visual interest. Your eye follows the height change and continues to the hood focal point. The rich countertop adds weight, but is softened by reflected light. Added pendants over the snack bar and task lighting under wall cabinets help brighten the space. 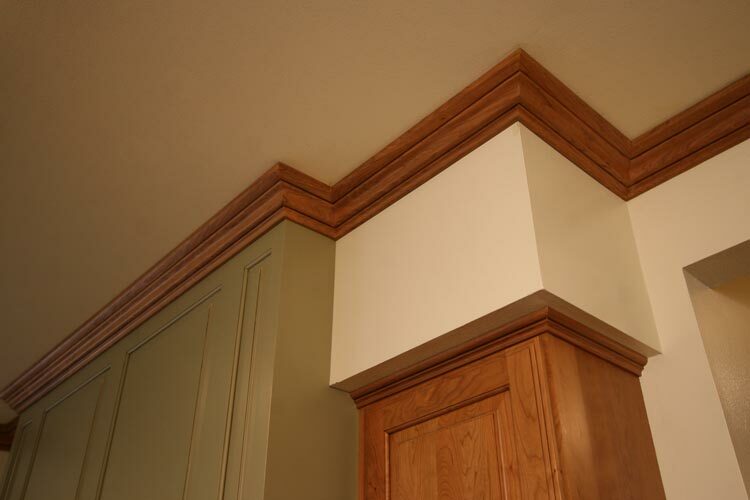 Simple corbels and flat plywood with applied moldings are to basic for this home and the style the homeowners would like to convey. 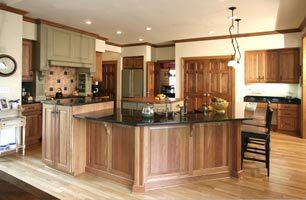 Wainscot panels, square columns, scalloped corbels, and furniture base bring details and traditional style to the island back. The well planned details and excellent carpentry blend nicely wit the rest of the kitchen. The existing kitchen lacked design style and theme. 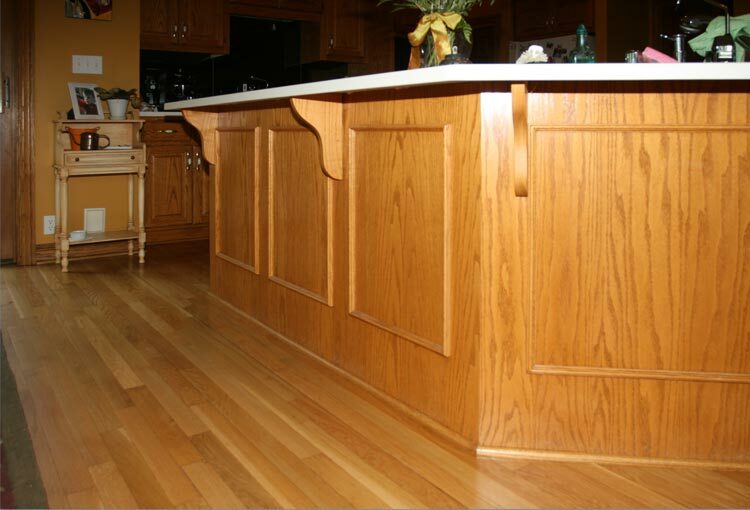 The common raised panel and oak in medium stain did not suite the homeowners style and taste. 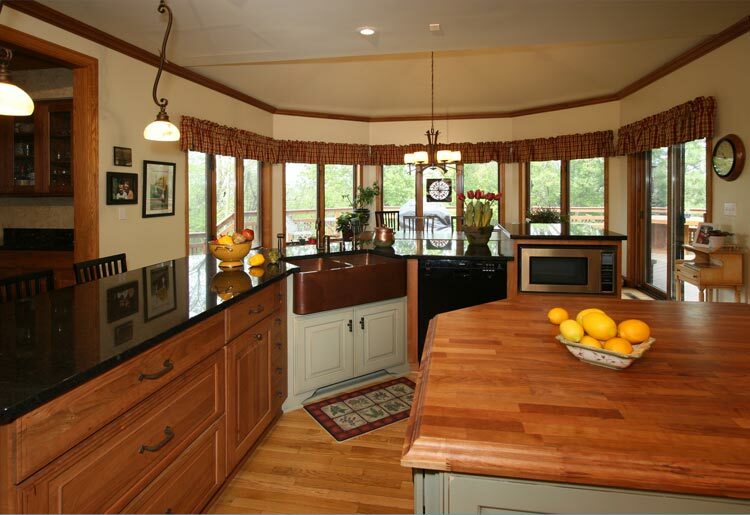 The remodeled kitchen has an overall English country theme. The mix of cabinetry furniture details, hardware, and plumbing fixtures all have individual style line that work together. 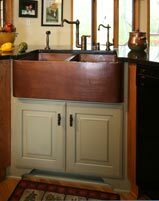 The painted cabinets with mink glaze are distressed to show a rub-through of the maple wood and provides an antiquing, that coordinates wit the English country theme. 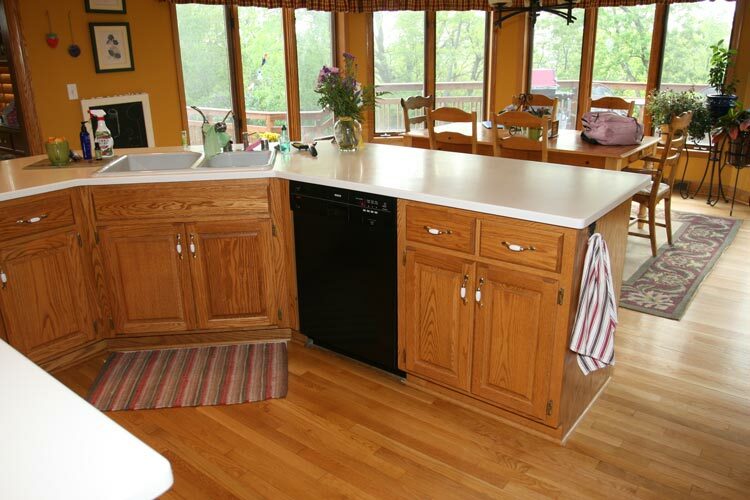 The sink island divided the space between the kitchen and the dinette area. Although it functioned well, the homeowners felt it needed some “spicing up”. 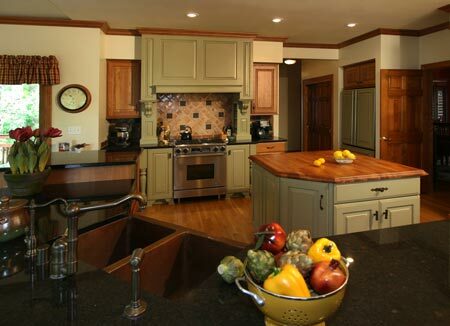 In keeping with the theme, the green sink cabinet contrasts the warm cherry and creates a secondary focal point. 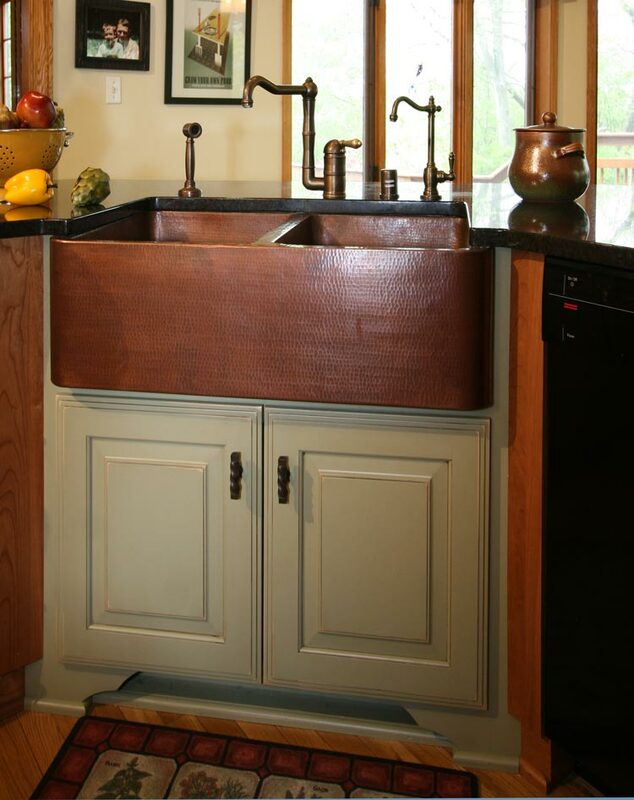 The double bowl, hand hammered copper apron sink and the Tuscan bronze faucets add that special touch and will age over time. 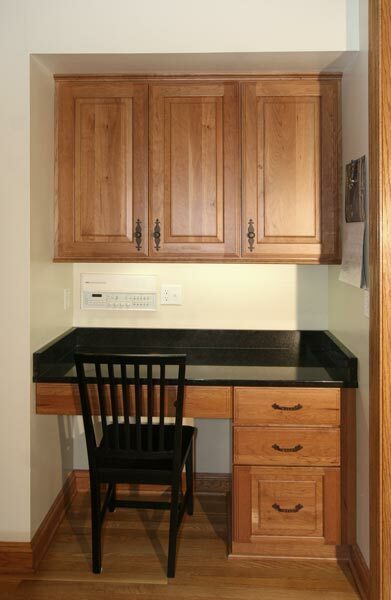 The sink island was constructed out of stock size cabinets and the homeowners desired better use of their space. 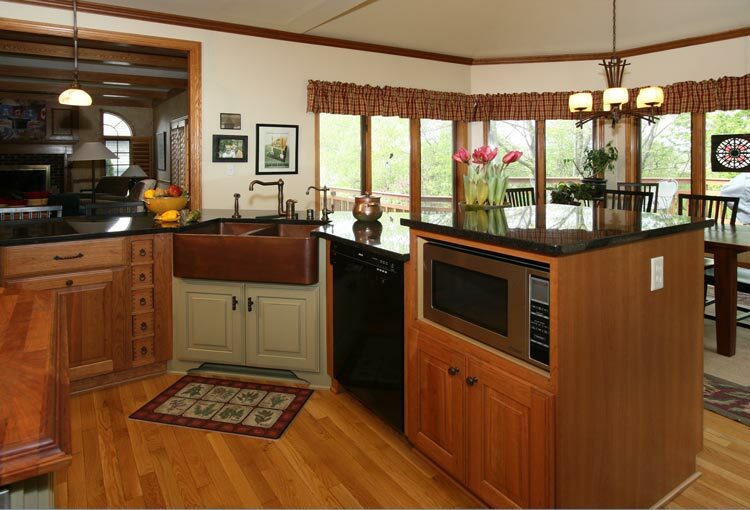 The island now houses a built-in garbage pull-out, apothecary drawers, and the microwave. 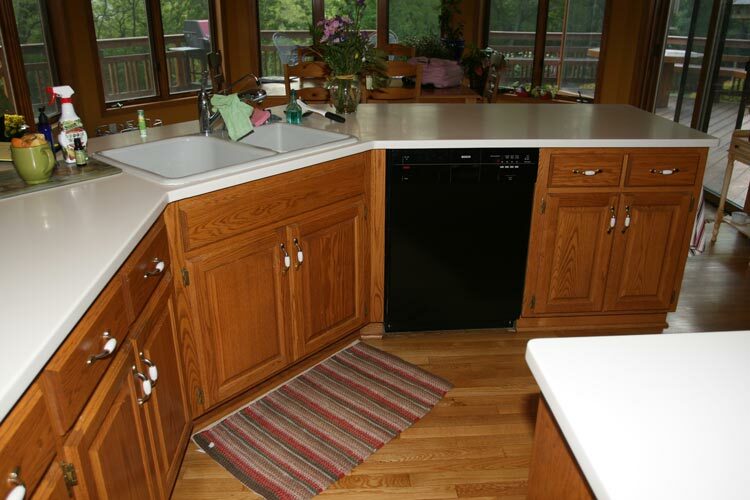 The wide sink base allows for appropriate spacing to keep the dishwasher functional. The microwave is raised to not only be at a more accommodating height, but to break up the expansive countertop. 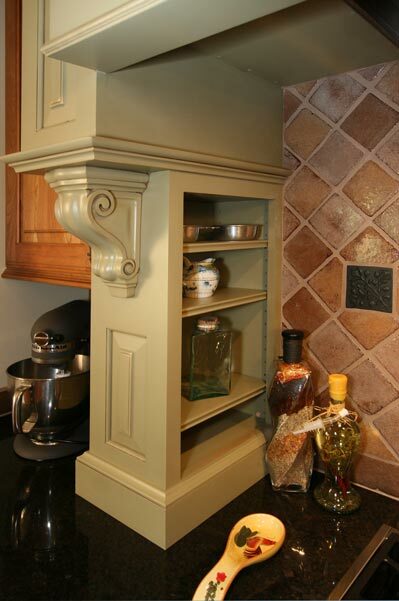 This custom cabinet also provides storage on the backside for the homeowner’s table linens. 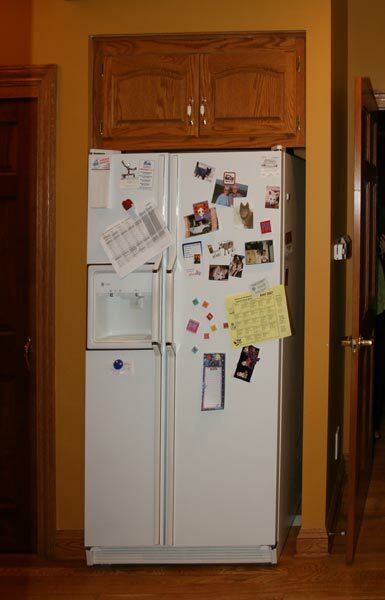 The location of the refrigerator, while not ideal, is appropriate for the homeowner who had no desire for it to be moved. However, the look and feel of the large object was an eyesore. 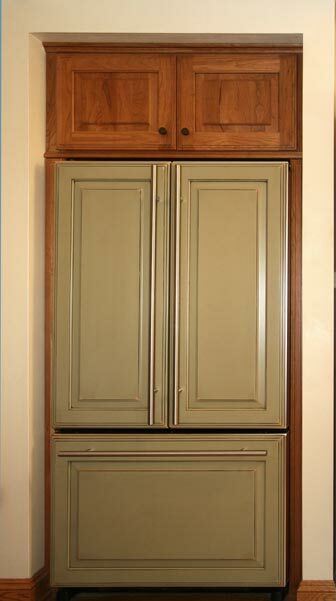 The new refrigerator was given a built-in look with side accent panels and then covered with decorative door panels. The existing desk area locate in the kitchen was efficient, but in need of a few changes. The cabinets needed to be changed to coordinate with the rest of the remodeled kitchen. 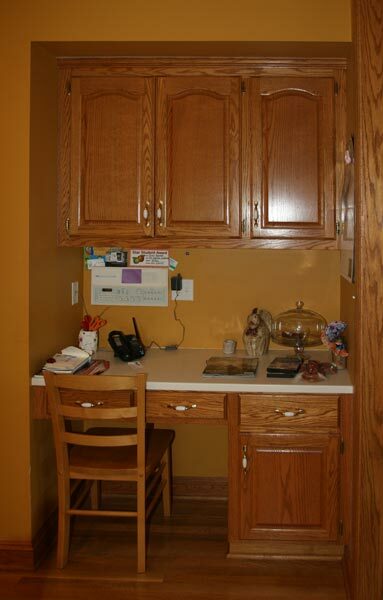 Cherry cabinets replace the old desk to coordinate with the rest of the kitchen. An additional drawer and file drawer provide better storage for the desk items. Copper Black granite, tops it off. 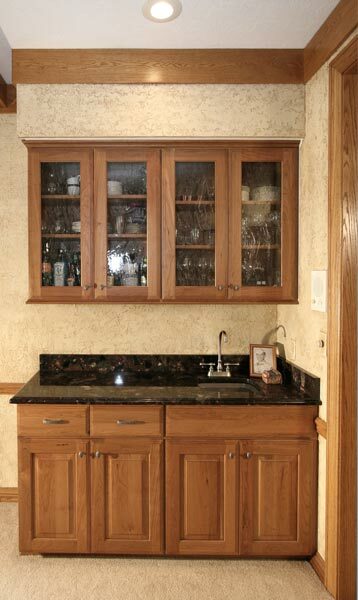 Just outside the kitchen, an existing wet bar needed to be replaced as well. The Corian countertop did not fit the homeowners style and the large sink was too obtrusive. New Cherry cabinets as in the kitchen replaced the old. Clear, swirled glass adds a modern touch to the doors and the Paladio granite with split stones provides a conservation topic. An undermount sink and gooseneck bar faucet completed the transformation. 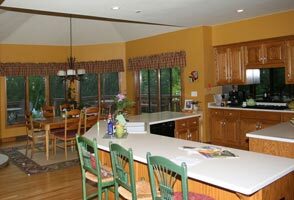 The existing kitchen, open to the dinette, had potential to be a great entertaining area for the family and guests. But the absence of color and texture gave an unfinished and uninviting space. The added pendants accent the snack bar stools which coordinates wit the new dinette table. To top the room off, crown molding was added at the ceiling which continues around the hood surround and entire room. Overall, the new space provides a warm and inviting gathering space that the homeowners are excited to show off.